Open Every day from Memorial Day weekend through October 24. * See our SPECIAL DISCOUNT BELOW for a great deal! (Thursday – Saturday) Breakfast and Dinner Included – Charges are on a Per Person, Per Night basis. (Sunday – Wednesday) Breakfast ONLY – Charges are on a Per Person, Per Night basis. 8% Tax and 10% Gratuity will be added to the final bill. 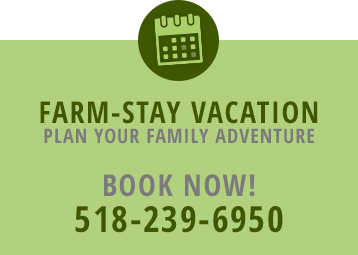 All rates include your own Private Guest House or Accommodations, Meals that are all you can eat, farm fresh and cooked to please, and of course the opportunity to explore and enjoy our entire 300 acres, seven-generation working family farm till your heart’s content. For more info, click here. Early Bird Discount – a 5% discount will be given for reservations booked before May 1st. A minimum of 2 nights are required for reservations. Check-in time is 3 pm or after. Checkout is 11:00 am. We require a deposit equal to one nights stay in order to hold your reservation with balance due upon arrival. Refunds, less 10% handling, issued to guests only if notified of cancellation 2 weeks prior to arrival date. There will be no refunds to guests who for any reason must leave prior to scheduled departure day. There will be no refunds for late arrivals.